US cable TV giant Comcast on Tuesday announced plans to add video chat to television viewing through a partnership with Skype. Comcast said customers would soon be able to make and receive video calls through high-definition televisions using Skype. "TV has evolved into a social experience, and Comcast and Skype will be delivering a product that personalizes the TV experience even more," said cable company president Neil Smit. "Our unique relationship with Skype not only will change how our customers interact with their TV, but also will create new and meaningful ways to bring our customers closer to the people they care about," he added. Comcast envisioned enabling people to make low-cost Internet video calls on "the biggest screen in the house" while watching big televised events or celebrating special occasions. "We can bring video calling to the heart of the home, allowing people to share life's experiences both big and small," said Skype chief executive Tony Bates. The service will work on high-definition television screens using an adaptor box, a video camera, and a TV remote control adapted for text messaging. 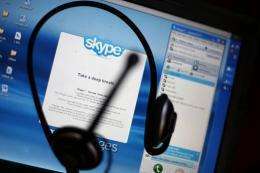 Comcast planned to begin testing the Skype service with customers in the coming months. The partnership came in the wake of Microsoft cutting a deal to buy Internet voice and video leader Skype for $8.5 billion dollars. "Together we will create the future of real-time communications so people can easily stay connected to family, friends, clients and colleagues anywhere in the world," Microsoft chief executive Steve Ballmer vowed while announcing the Skype acquisition last month. Microsoft said Skype will become a new business division within Microsoft with Skype CEO Bates assuming the title of president of the Microsoft Skype Division, reporting directly to Ballmer.